← Day 863 – Another Gatsby Film Flop? I’ve been frozen this week, both literally and literally. 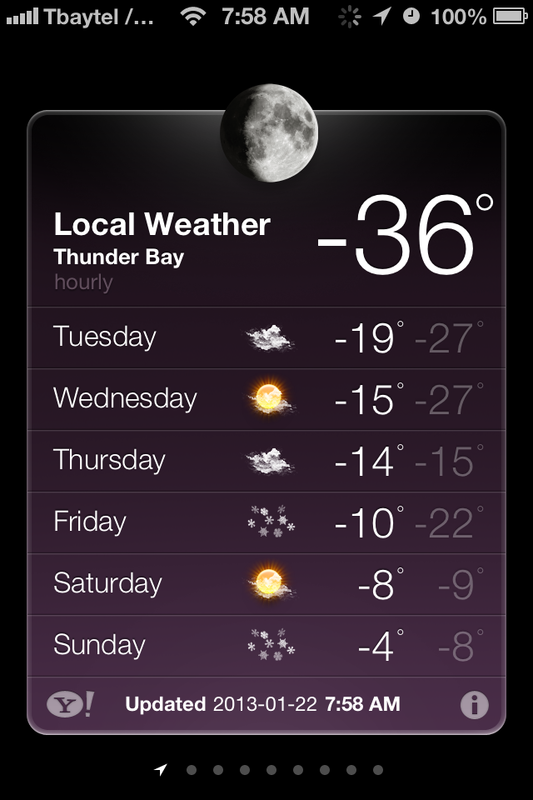 Here’s what the temperature was when I put the kids on the bus on Monday. For all you US readers out there, -36 Celsius is just about -36 Fahrenheit — the “sweet spot” where they meet up is actually -40. Either way, it’s cold. More importantly in terms of this blog, I’ve also been frozen writing-wise. I’ve put myself in a bit of a corner. I’ve put a deadline on this draft, though I know the book isn’t ready yet to send out to people. I could have something finished by January 31 — and I will have something finished. But what it won’t be is a ready-to-read Draft 2. So of course, to combat the problem when I realized this, what I did was push it behind the tin of tea in the corner of the counter and forget about it for a week. I hear this is quite normal for writers, especially those who only drink tea on occasion and therefore won’t be constantly reminded by the sight of the manuscript every time they make a cuppa. Had some chai tonight, saw the poor thing just sitting there, and decided to do some work on it. 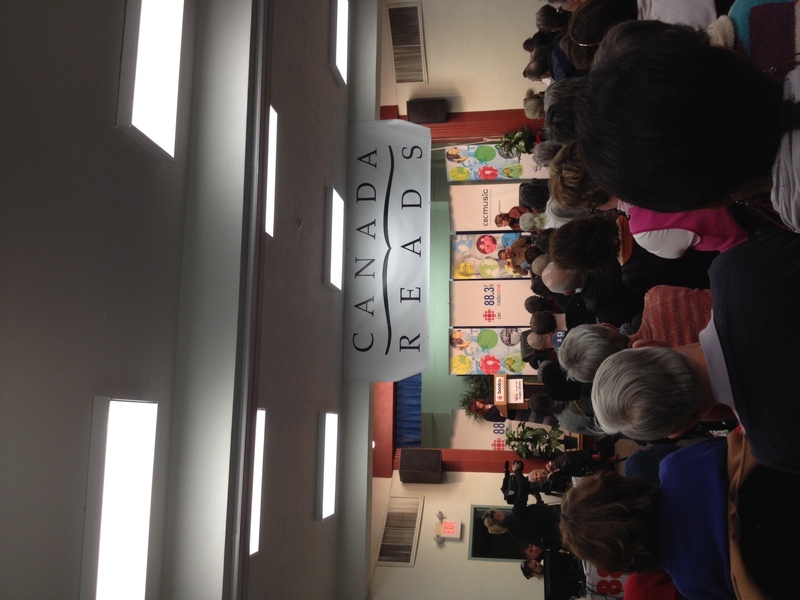 Was inspired too by going to a Canada Reads event here tonight, where Jane Urquhart and Richard Wagamese (click the image to enlarge), both up for the next Canada Reads book of the year, did a reading and answered some questions. They are from Northwestern Ontario originally, though both moved away a long time ago when they were kids. I wonder if they consider themselves to be Northwestern Ontario writers? Likely not, though they obviously have an affinity to the area since they both have used the region in their books. That would have been a good question to ask during the Q&A. So Draft 2 — still in the works, and likely will be into February. But when my deadline whooshes by me next week, it won’t be a total loss. I’ve put more time into the book this month than I have for a while. 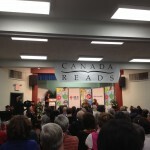 This entry was posted in Daily Report and tagged Canada Reads, Cold, Jane Urquhart, Richard Wagamese. Bookmark the permalink. I drink tea by the gallon so the biscuit bin has to do. Ha! That would work too. Bread boxes and microwaves are also excellent substitutes, especially for those epic novels. 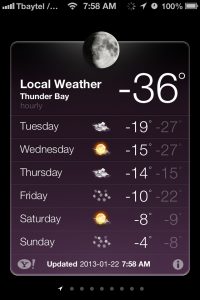 Scheez, at -36, what could you do besides write? Well, wait. Don’t answer that. If it really is that cold, I’d store the draft outdoors, where it won’t spoil, though there is clearly some risk it’ll be found and shredded by a particularly critical (and literate) squirrel.